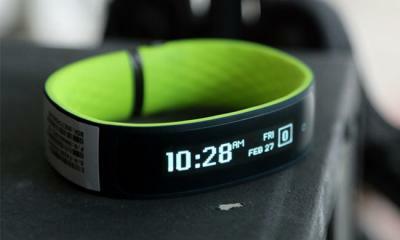 HTC's Grip is a fitness tracker that was developed together with Under Armour. The wearable device sports a curved monochrome (white) PMOLED display, which seems to be Futaba's 1.4" 128x16 film OLED (similar to the one used in Garmin's Vivosmart). The Grip includes the usual range of sensors in addition to an internal GPS chip. The Grip was supposed to ship in the US in the spring for $199, but HTC later decided to re-design the device and this specific design will never ship.